First, this is not a sponsored post. I just wanted to try out purple hair. My hair is super dark brown almost black. I did some googling and could not find out much about how it might turn out if I didn't lighten my hair like suggested. I tried to get a picture but my hair didnt even look different. Just dark brown. In full sun there is a tint of purple that people will see if you point it out. Most people probably won't notice. At work no one even noticed. I had sent my manager a spoof picture of a beautiful purple braid from my pinterest page. I think he was relieved it wasn't as bright as the picture. I left the color on for 12 hours. So longer would not have made a difference IMHO. 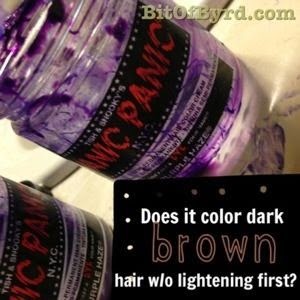 Manic Panic has no harsh chemicals. It is made in the USA. It comes in lots of colors. It made my hair feel really soft. Will manic panic color dark brown hair without lightening it? No, not like the box. It will just tint it. Have you ever colored your hair a crazy color? How did it turn out?